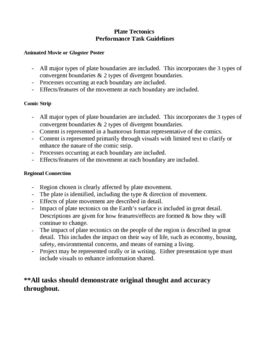 These are the guidelines for 3 different projects related to plate tectonics that you can have the students choose from. The first choice is an animated movie or poster showing the different types of plate boundaries and the effects of the plates interacting. The second choice is a comic strip showing all of the characteristics of the plate boundaries and their interactions, and the third choice is regional connection where the student research a region and report on how the plate boundaries affect the landscape and the people's way of life.